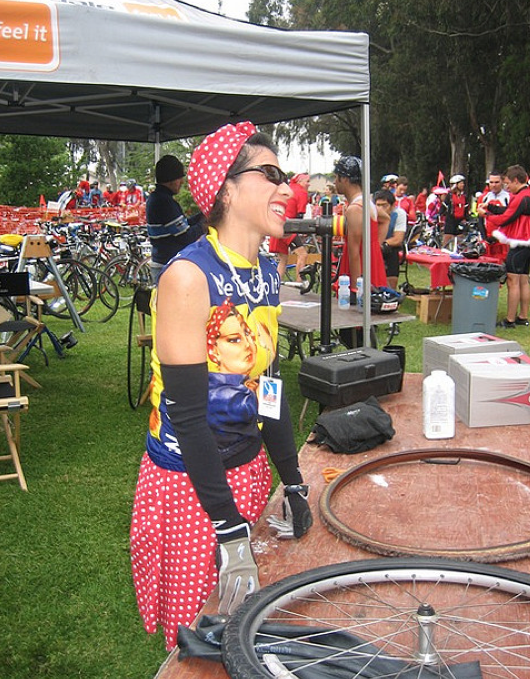 Here’s a little story about one of the people I met on AIDS/Lifecycle. He was a compassionate soul who helped me through a difficult day. Let’s call him the Man in the Red Shirt. I was working as a Bike Tech that year. It was Day 4 of my first AIDS/Lifecycle. I’d gotten dehydrated from too much coffee, a heavy workload, and not enough water. I felt sick to my stomach, and woozy. So off to the medical tent I was sent. As I lay there on the cot, staring up at the ceiling, a gentleman in a bright Red t-shirt with the word “MEDICAL” sat down next to me. He took my information, then told me a funny story that made giggle. After he set me up with an IV, he tended to another patient in need. I began to feel better. I started to think about being a part of my first Red Dress Day, and how exciting it would be: I was imagining one big fashion show and costume party, in RED, and on bikes! And all, as a celebration of saving lives. I was looking forward to seeing the riders who stopped by Bike Tech every day just to say “Hi”. So many riders were excited about what they’d be wearing. As I began to wonder what Ginger Brewley would be wearing, it hit me: Red Dress Day is tomorrow! Would I be well enough to make it? or would I be stuck in here on this cot? I have to work Red Dress Day. I just have to. Tears welled up in my eyes; I couldn’t help it. I was probably more emotional from being so dehydrated, but I just started sobbing. The Man in the Red Shirt sat down next to me and gently asked, “Honey, what’s wrong?” I was embarrassed. With all the problems in this world, this was why I was crying? Really? But he just knew. “Red Dress Day?” he asked. Looking into his eyes, I realized that he wasn’t making fun of me; he understood the importance of being of service to AIDS/Lifecycle, as well as the importance of witnessing great fashion. He just knew. Thanks to his care and kindness, I was released a few hours later, and on Day 5, I worked Red Dress Day. And it was FABULOUS. Many thanks to the Man in the Red Shirt. I can hardly write after working as a bike tech, but I only worked half the hours that others did. I was also in charge of a mobile clothing store, so only worked as a bike tech from 9am – 4pm. My 45 year old fingers are still swollen, but I’ll do it all again next year, with bells on. It was an honor to be a member of such a dedicated crew. While my wrists are mending, here’s a lil’ something I threw together. I hope ya like it….